REUNITED!! Kira has safely come home and in less than 48 hours!! thank you so much for all the help and information, really kept us calm through the whole ordeal. Thank you so much! !❤️🙏 words cant express how grateful I am, really thank you! Yea definitely going to the vet ASAP thank you thank you, he’s nice ‘n’ fed and hydrated! ready for a good nights rest finally!! My Double Yellow Headed Amazon flew off 10/01/2018 around noon in the area of NW mill creek dr and murray blvd. 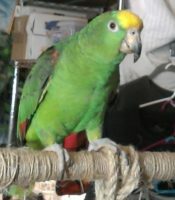 He’s barely 2 years old so doesn’t look like a normal adult yellow headed amazon and is mostly Green with a yellow spot on top of his head. His name is Kira. Favorite things to say are usually Hello and how are you. Will also sometimes caw like a crow and will usually respond to a whistle like the sound of a twitter tweet. IF YOU SPOT HIM, PLEASE NOTIFY ME ASAP. He’s very scared of pretty much everything which is another reason I still can’t believe he actually took off. So please contact me if you spot him so I can come and try to get home down. HE’S VERY SCARED OF LANDING so will probably be up in a tree somewhere within a mile or two of the address above.